One of the Taliban’s top two spokesmen bragged that the group called off negotiations with the US after the latter pleaded for peace talks. 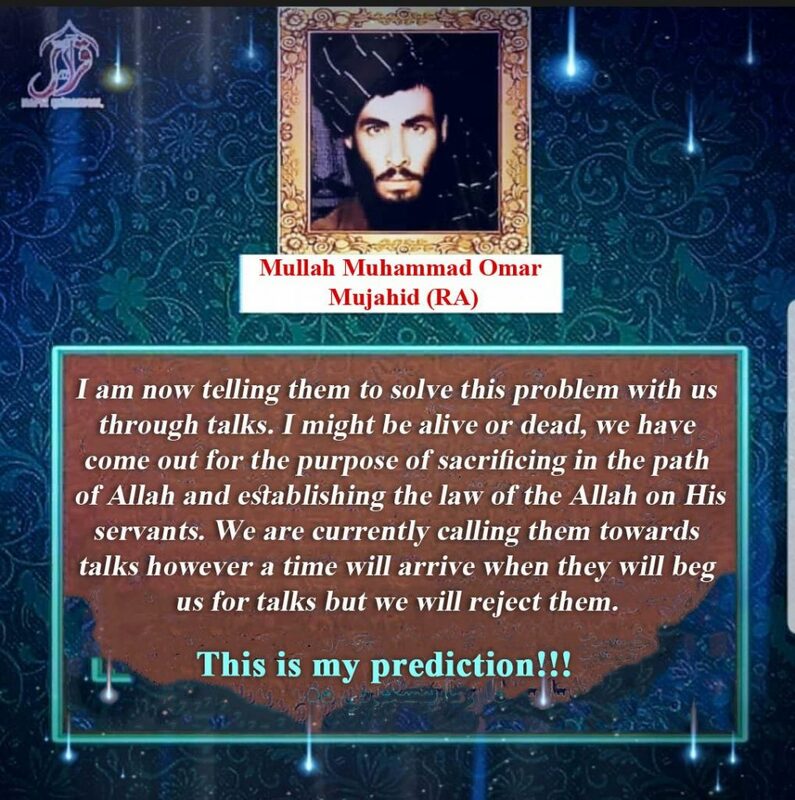 Zabihullah Mujahid, the Taliban spokesman, suggested that this very situation was predicted by Mullah Omar, the group’s founder who died in 2013. The statement was issued only days after the Taliban canceled talks with the US over attempts to include the Afghan government in negotiations. Mujahid attributed the statement to Omar on his Twitter account on Jan. 20 which also included a photograph of the Taliban founder and first emir. According to Mujahid, the statement was a “prediction” by Omar that was issued sometime before his death. Omar died of natural causes in Pakistan in 2013; his death was hidden by the Taliban for two years before it was announced. “We are currently calling them towards talks however a time will arrive when they will beg us for talks but we will reject them,” the text accompanying Omar’s image says. The Taliban canceled preliminary peace negotiations with the US that were to be held in Qatar on Jan. 9 over an “agenda disagreement,” according to Reuters. The Taliban is said to have objected to the US attempts to include the Afghan government in the talks, as well as discussions of a ceasefire and prisoner exchange. “Hence the Islamic Emirate warns the United States that if the current state of affairs continues and America sustains her insincerity, then the Islamic Emirate will be forced to stall all talks and negotiations,” the statement concluded. Four days later, when it was rumored that the Taliban would re-enter talks in Islamabad, Mujahid outright denied it. “Rumors about some meeting between US representative @US4AfghanPeace [Zalmay Khalilzad] & representatives of Islamic Emirate in #Islamabad are untrue,” Mujahid tweeted on his official account. The Taliban has consistently maintained that it would not negotiate with the Afghan government, which it views as an “impotent” “puppet” that takes its orders from the US. Talking with the Afghan is a “waste of time,” the Taliban has said. Before talks can begin, the Taliban demands that the US withdraw its forces from Afghanistan, release its prisoners, and remove Taliban leaders from the United Nations blacklist. The Taliban also maintains that only its Islamic Emirate of Afghanistan is the legitimate representative of the Afghan people, and that imposing an “Islamic government” on them is the only acceptable outcome. This was reiterated in Omar’s statement that was released by Mujahid. “We have come out for the purpose of sacrificing in the path of Allah and establishing the law of the Allah on His servants,” Omar said. The US has accelerated efforts to negotiate a settlement after President Trump has grown frustrated over the situation in Afghanistan. Trump reportedly will order a significant reduction of troops and may end the US mission by 2020. Both the US and NATO have refused to recognize the Taliban’s religious motivations for continuing the 18 year long war, and have operated under the assumption that the Taliban is willing to enter into a power sharing agreement with the Afghan government. The Taliban has explicitly stated it will not share power with the Afghan government. “The Islamic Emirate has not readily embraced this death and destruction for the sake of some silly ministerial posts or a share of the power.” the Taliban said in an official statement that was released in 2016. Interesting that they hid his death due to natural causes. Perhaps they were embarrassed that he didn’t die the death of a martyr. In any case, I think it is one of the flaws of the drone war, that we focus on killing the enemy, when what is more important is discrediting the enemy (dead or alive) in the eyes of his followers. you do not talk to the taliban, you KILL them! Being unable to hunt the Taliban leadership in Pakistan does not help; is the Pak mil so good that America is scared to even fathom sending in kill teams? Why aren’t we hearing about truck bombs outside taliban compounds and recruitment centers in Quetta? On that note, request the Israelis for covert help — they’re good at tracking and killing enemies; paying them billions in annual aid for years and years, can’t they help? Without such pressure, yes the Taliban are correct, America will only negotiate its surrender. When will we learn that there is no middle ground with the Taliban. Either we kill them — or they will kill us. From what I recall about this Mullah Omar, he was absolutely opposed to negotiating with the West under any circumstances. His position (at least publicly) was that he would only talk (presumably with the Karzai gov’t) if (and only if) and after the Coalition had left Afghanistan. I believe that the statement quoted above and attributed to Omar may very well have been made up. At the very least, if he had said anything close to the above, it has been altered. Also, I am at least more than a trite suspicious about the Taliban version (and circumstances) of his death. If he had really died of an ongoing long-term illness (as they claim), then why would they keep his death secret and lie about it to the public for so long? There has to be an reasonable explanation for it.